The human erythropoietin (hEPO) is the main hormone concerned with stimulation of erythropoiesis and maintain of erythroid stem cells physiologic levels. Its deficiency causes severe anemia and happens to patients with kidney failure because of traumas, graft, chemotherapy, diabetes, etc. Hormone supply is an essential treatment on these patients. Currently, the recombinant human erythropoietin (rhEPO) is mainly produced in genetically modified CHO cells, regardless of the high cost, because those produced in other cell lines or organisms have different patterns of glycosylation and subsequently a reduced in vivo activity. One alternative could be use a rhEPO without glycosylations, however, this variant has almost null in vivo activity, despite of having a higher in vitro activity and affinity for its receptor (EPOR) than native hEPO. The glycosylations generates limitations for the production of rhEPO, but they give important advantages to the protein like an augmented molecular weight and a decreased affinity for EPOR. In this review we summarized the principal biotechnological problems of the rhEPO glycosylations and we give insights of some possible solutions that have been tried to overcome those issues. La eritropoyetina humana (hEPO) es la principal hormona encargada de estimular la eritropoyesis y mantener los niveles de las células madres hematopoyéticas. Su deficiencia causa anemia severa y ocurre en pacientes con fallo renal debido a traumas, trasplantes, quimioterapia, diabetes u otros. Para el tratamiento de estos pacientes es necesario el suministro externo de la hormona. En la actualidad la eritropoyetina humana recombinante (rhEPO) es producida en cultivo de células CHO, a pesar del alto costo, debido a que la producida en otras células u organismos presenta patrones de glicosilación diferentes y por tanto una actividad in vivo disminuida. Una alternativa podría ser utilizar rhEPO sin glicosilaciones, sin embargo, esta variante posee una actividad in vivocasi nula, a pesar de poseer una mayor actividad in vitro y mayor afinidad por su receptor (EPOR) que la hEPO nativa. Las glicosilaciones generan limitaciones en la producción de la rhEPO pero le otorgan importantes ventajas a la proteína como un aumento de peso molecular y una disminución de la afinidad por EPOR. En esta revisión bibliográfica repasamos los principales problemas biotecnológicos que conllevan las glicosilaciones de la rhEPO y revisamos algunas posibles soluciones que se han intentado para superar estos problemas. 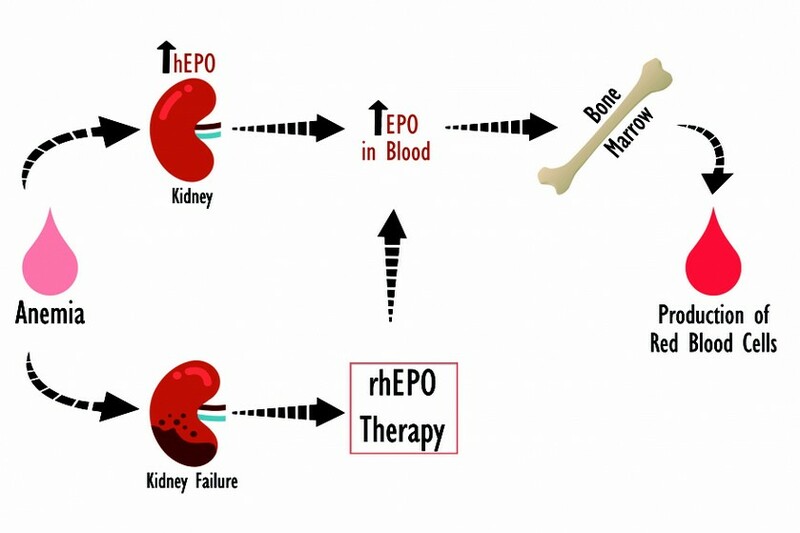 Human Erythropoietin (hEPO) is the main hormone involved in the differentiation, proliferation and maintaining of physiologic levels of erythroid stem cells1, it was also the first hematopoietic growth factor known2. The hEPO is an acid glycoprotein, produced by the liver during the fetal stage and mostly the kidney in adult, it is mainly secreted as a response of acute anemia (Figure 1). It’s regulation depends on blood oxygen levels and its expression is controlled by the hypoxia inducible factor HIF13. The hEPO is a 165 amino acids glycoprotein and an estimated molecular weight of 30,4 kDa. It has two internal disulfide bonds between the cysteines 7-161 and 29-33, which are essential for maintaining the biological activity4,5. The glycosylations are 40% of the protein molecular weight and they are located in three potential N-linked glycosylation sites on Asn24, Asn38 and Asn83, plus a potential O-glycosylation site on Ser1266–9. These glycosylations plays an important role for hEPO in vivo activity and it has been described that the most active fraction is the one with tetra-antennary tetra-sialylated terminations10,11. The glycosylations reduces rhEPO glomerular filtration rate thanks to the increase in molecular weight and they also reduces its hepatic clearance because of the sialic acid terminations which protects it from galactose and mannose receptors in the liver7,12,13. The deficiency of hEPO in the organism causes severe anemia. This condition is observed in patients with chronic kidney failure associated primarily to trauma, transplants and diabetes14. Deficiency of hEPO is also associated to the effects of cancer chemotherapies, zidovudine treatments in patients with HIV and ribavirin treatment in patients with Hepatitis C. The administration of the recombinant hormone is essential to solve or minimize the effects of the anemia on this diseases15,16, as it shows the Figure 1. Figure 1. Function of hEPO and importance of rhEPO. Under normal conditions the kidney secretes hEPO in response to anemia. This causes a stimulation of differentiation and proliferation of erythroid stem cells in bone marrow, thus correcting the anemia. When the kidney is damaged it is needed an external supply of the recombinant hormone to prevent chronic anemia. Almost all recombinants human Erythropoietin (rhEPO) used today as a biopharmaceutical are produced in genetically modified CHO cells. This cell line comes from the ovary of Chinese hamster and is widely used for the expression of recombinant proteins with therapeutic purposes. The current production of rhEPO and its variants, for both clinical and research purposes, is mainly done in mammalian cell lines due to the structural complexity of rhEPO and the importance of posttranslational modifications on its activity5,7. Some groups have produced rhEPO in bacteria like Escherichia coli and Bacillus brevis, but it lacks in vivo activity due to the absence of glycosylations17,18. Since yeast or filamentous fungi are commonly used for the production of complex proteins, they could be a solution for rhEPO, however they generate a different pattern of glycosylation which affects glycosylation sensitive proteins like rhEPO19,20. That is why enterprises like GlycoFi Inc, a Merck & Co. subsidiary, have emerged. They produce biopharmaceuticals in yeast strains that are engineered to perform specific human glycosylation. For example, they have produced sialylated rhEPO in “humanized” Pichia pastoris and showed that it was functional with a pharmacokinetics and a pharmacodynamics similar to the rhEPO produced in CHO cells21,22, despite having mostly bi-antennary glycosylations23. Nowadays, all products of rhEPO commercialized in USA or Europe are produced in CHO cell line24. Although, some groups have tried different cell lines, such as rhEPO produced in myeloma, kidney of baby hamster, kidney of human embryo and human retina derived cells25. These cell lines generate different patterns of glycosylation, but CHO and BHK cells were found to sialylate rhEPO more effectively26. It is known that each of the three potential N-linked glycosylation sites can be occupied with a range of possible different glycans, and this is also valid for the potential O-linked glycosylation site27–32. This glycan heterogeneity is presented among different cell lines, different products synthetized in the same cell line and even among batches of the same product27,30,33–38. From a biotechnological point of view, this is a particularly relevant problem because it causes, for rhEPO, a dependence between the in vivo activity and production method due to variation of posttranslational modifications7,35,37,39. Recombinant proteins production in mammalian cell have drawbacks such as the high cost and the fact that is a technically demanding process40. An alternative method used to overcome these problems is the production of recombinant proteins in the milk of transgenic animals41–43. Using this technology it is possible to detect the protein in the milk of transgenic animals, but the expression levels are low and it is reported that ectopic expression of the gene can affect the health of the animal43. Another alternative has been the in situ transduction of the mammary gland with viral vectors. Using adenoviral vectors Sánchez O. et al (2004)43 achieved high levels of human growth hormone (hGH) in the milk of mice and goats. Later, they produced as high as 2 g/L of rhEPO in goat’s milk44. These results show the capability of producing high levels of recombinant proteins in the milk of non-transgenic animals. However, the rhEPO produced in goat milk showed a low in vivo hematopoietic activity caused by a different pattern of glycosylation, specifically it presented a low level of sialylation46,47. Figure 2 summarizes representative glycosylation patterns for rhEPO of some production methods mentioned above, it is important to note that all cells and organisms generate a broad spectrum of intermediate glycosylations. Figure 2. Representative glycosylation pattern for rhEPO. Çalic et al. (2007)20 described the high mannose pattern of rhEPO produced in P. pastoris. Gong et al. 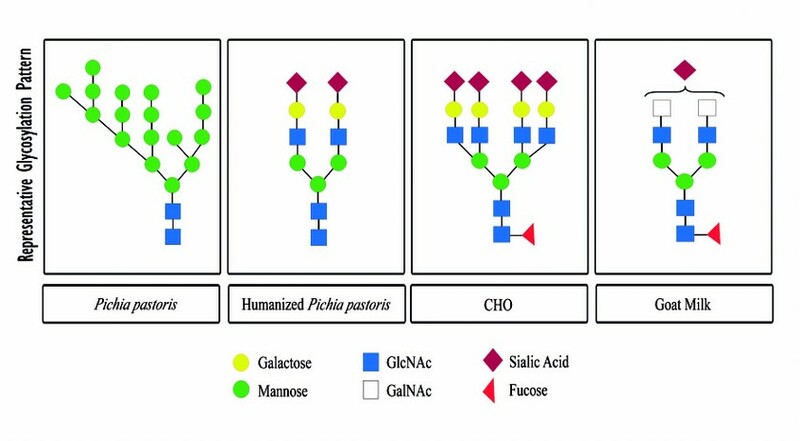 (2013)23 described the glycosylation pattern of humanized P. pastoris as bi-antennary bi-sialylated. Sasaki et al. (1987)27 defined the glycosylation pattern of rhEPO produced in CHO cells, the most abundant and active fraction is tetra-antennary and tetra-sialylated. Montesino et al. (2008)47 studied the glycosylation pattern of rhEPO produced in goat milk, the most abundant and finished fraction is bi-antennary and mono-sialylated. One of the most important mechanisms of signaling regulation of hEPO is the internalization of the complex between hEPO and its receptor (EPOR) and later degradation of the hormone at target cells58–60. The internalization of hEPO-EPOR complex also controls the cell sensitivity to the hormone and it is crucial to negatively regulate hEPO levels on blood circulation61,62. In fact, evidence shows that the clearance of hEPO is directly correlated with EPOR levels at bone marrow63–67. One interesting fact is that the persistence of union between hEPO and its receptor is altered by the high content of sialic acid. The reason for this is that negatively charged glycosylations alter electrostatics interactions and causes a diminished affinity inversely related to the number of glycosylations68,69. The base of this is the interaction at complex interface which occurs between positively charged amino acids at rhEPO and negatively charged amino acids at EPOR70. The decreased affinity of hEPO for EPOR, given by glycosylations, causes an increase on its half-life thanks to a lower internalization of the complex62. All this knowledge has been utilized to create the biopharmaceutical Darbepoetin alfa (Aranesp®), which is based on a hyperglycosylated rhEPO. The excess of glycosylations gives it a four times lower affinity for EPOR plus a higher molecular weight which results in a three times greater half-life than native hEPO69,71. Studies with Darbepoetin alfa has shown that excess of glycosylations, independent of position, increases the persistence of rhEPO in blood circulation. This generates an augmented and prolonged in vivo activity which overcome the affinity reduction to its receptor72. It could look paradoxical that a decrease in affinity for the receptor increases the in vivo activity, but this happens because the signaling process of hEPO-EPOR complex is fast and as soon as it forms, internalization and degradation begins73–75. Because of this, a drop in affinity for the receptor allows hEPO to keep on blood circulation longer and acting over a higher number of target cells. One of the main roles of hEPO glycosylations is the increase of half-life thanks to a reduction of its glomerular filtration and hepatic clearance. Unfortunately, from a clinical point of view rhEPO does not last long enough in blood, only six to eight hours and it must be administered to patients two to three times per week. Therefore, the costs for the patient or the health system increases even more. After the patent of rhEPO as a biopharmaceutical, presented by Amgen Inc. expired in 2005, a variety of biosimilars and biobetters have been made. To improve rhEPO half-life is the primary goal of different laboratories and companies searching to reduce the number of doses required. The main strategy has been to increase the molecular weight through different ways like the fusion with albumin76, fusion with glycosylated peptides77,78, formation of homodimers by linker peptides79–81, hyperglycosylation69,71 and polyethylene glycol (PEG) conjugation82,83. PEG conjugation strategy has led to the creation of a long-lasting erythropoiesis stimulator like Mircera® (Roche) which needs only one administration per month. Although its cost-effectiveness is not clear84. Another approach to increase the molecular weight is the fusion with a Fc portion of an IgG. This strategy has been tested in human and already exists some commercially available products like CTLA4-Fc (Orencia; Abatacept), LFA3-Fc (Amevive) and TNFR-Fc (Enbrel)85. Considering this, rhEPO-Fc variants has been generated and produced in CHO, NS/0, PerC6 and BHK cells86. A rhEPO fused with a IgG2 Fc portion showed an important extension of half-life and the need of only one dose per week87,88. Genexine, Inc. has created a rhEPO fused with a Fc derived from IgD and IgG4 which passed phase I clinical trial89 and it is currently under phase II. Salgado E. et al (2015)90 generated and produced in goat’s milk an rhEPO fused to a IgG1 Fc. This group reported that the altered glycosylation pattern, of mammary gland, considerably affected rhEPO-Fc in vivo activity, despite of the substantial increase in molecular weight. The in vivo hEPO activity has a direct relation with its glycosylation and provides advantages like enhanced half-life, a decrease in the affinity for EPOR and other like improved folding, secretion and biodistribution48,50,91. However, for the hormone recombinant production the different glycosylation patterns, provided by the selected cell line, are an issue. Heterogeneity carries extra steps during downstream. The mandatory use of mammalian cell, for produccing rhEPO, increases the final costs. Besides, the glycosylations are not enough to increase the molecular weight for completely avoid glomerular filtration. Currently, different groups are developing groundbreaking approaches to modify the protein and improve its half-life. Although, these strategies have to prove their cost-effectiveness. On the other hand, the approach of “humanizing” different productive organisms could be very useful because it could considerably reduce the production costs of glycosylated rhEPO, which is the “active component” of all the biosimilars and biobetters. Although, the production of new and differents “active components” with same erythropoiesis efficacy and less structural complexity could be game-changing. 1. Krantz S. Erythropoietin. Blood. 1991;77(3):419-434. 2. Fisher JW. Erythropoietin: pharmacology, biogenesis and control of production. Pharmacol Rev. 1972;24(3):459-508. 4. Recny MA, Scoble HA, Kim Y. Structural characterization of natural human urinary and recombinant DNA-derived erythropoietin. Identification of des-arginine 166 erythropoietin. J Biol Chem. 1987;262(35):17156-17163. 5. Lai PH, Everett R, Wang FF, Arakawa T, Goldwasser E. Structural characterization of human erythropoietin. J Biol Chem. 1986;261(7):3116-3121. 9. Browne JK, Cohen AM, Egrie JC, et al. Erythropoietin: Gene cloning, protein structure, and biological properties. Cold Spring Harb Symp Quant Biol. 1986;51(1):693-702. 11. Wasley LC, Timony G, Murtha P, et al. The importance of N- and O-linked oligosaccharides for the biosynthesis and in vitro and in vivo biologic activities of erythropoietin. Blood. 1991;77(12):2624-2632. 12. Lukowsky W, Painter R. Studies on the role of sialic acid in the physical and biological properties of erythropoietin. Can J Biochem Cell Biol. 1972;50(8):909-917. 13. Spivak JL, Hogans BB. The in vivo metabolism of recombinant human erythropoietin in the rat. Blood. 1989;73(1):90-99. 27. Sasaki H, Bothner B, Dell A, Fukuda M. Carbohydrate structure of erythropoietin expressed in Chinese hamster ovary cells by a human erythropoietin cDNA. J Biol Chem. 1987;262(25):12059-12076. 28. Takeuchi M, Takasaki S, Miyazaki H, et al. Comparative study of the asparagine-linked sugar chains of human Erythropoietins purified from urine and the culture medium of recombinanat chinese hasmter ovary cells. J Biol Chem. 1988;263(8):3657-3663. 43. Mikus T, Malý P, Poplstein M, Landa V, Trefil P, Lidický J. Expression of human erythropoietin gene in the mammary gland of a transgenic mouse.pdf. Folia Biol (Praha). 2001;47(6):187-195. 48. Higuchi M, Oh-eda M, Kuboniwa H, Tomonoh K, Shimonaka Y, Ochi N. Role of sugar chains in the expression of the biological activity of human erythropoietin. J Biol Chem. 1992;267(11):7703-7709. 49. Misaizu T, Matsuki S, Strickland TW, Takeuchi M, Kobata A, Takasaki S. Role of antennary structure of N-linked sugar chains in renal handling of recombinant human erythropoietin. Blood. 1995;86(11):4097-4104. 50. Tsuda E, Kawanishi G, Ueda M, Masuda S, Sasaki R. The role of carbohydrate in recombinant human erythropoietin. Eur J Biochem. 1990;188(2):405-411. 51. Imai N, Higuchi M, Kawamura A, et al. Physicochemical and biological characterization of asialoerythropoietin. Suppressive effects of sialic acid in the expression of biological activity of human erythropoietin in vitro. Eur J Biochem. 1990;194(2):457-462. 52. Goldwasser E, Kung CK, Eliason J. On the mechanism of erythropoietin-induced differentiation. 13. The role of sialic acid in erythropoietin action. J Biol Chem. 1974;249(13):4202-4206. 53. Mufson RA, Gesner TG. Binding and internalization of recombinant human erythropoietin in murine erythroid precursor cells. Blood. 1987;69(5):1485-1490. 55. Fratantoni J.C. SKB. Evaluation of Recombinant Human Erythropoiein as a Therapeutic Agent. In: Anthony S. Lubiniecki and Susan A. Vargo., ed. Regulatory Practice for Biopharmaceutical Production. ; 1994. 58. Kato M, Kamiyama H, Okazaki A, Kumaki K, Kato Y, Sugiyama Y. Mechanism for the nonlinear pharmacokinetics of erythropoietin in rats. J Pharmacol Exp Ther. 1997;283(2):520-527. 64. Chapel S, Veng-Pedersen P, Hohl RJ, Schmidt RL, McGuire EM, Widness JA. Changes in erythropoietin pharmacokinetics following busulfan-induced bone marrow ablation in sheep: evidence for bone marrow as a major erythropoietin elimination pathway. J Pharmacol Exp Ther. 2001;298(2):820-824. 71. Macdougall IC, Gray SJ, Elston O, et al. Pharmacokinetics of novel erythropoiesis stimulating protein compared with epoetin alfa in dialysis patients. J Am Soc Nephrol. 1999;10(11):2392-2395. 73. Landschulz KT, Noyes AN, Rogers O, Boyer SH. Erythropoietin receptors on murine erythroid colony-forming units: natural history. Blood. 1989;73(6):1476-1486. 83. Macdougall IC. CERA (Continuous Erythropoietin Receptor Activator): a new erythropoiesis-stimulating agent for the treatment of anemia. Curr Hematol Rep. 2005;4(6):436-440. 86. Stephen D. Gillies SL. Fc-erythropoietin fusion protein with improved pharmacokinetics US 20090092607 A1. December 2009. 88. Sun L-HK, Sun BNC, Sun CRY. Fc fusion proteins of human erythropoietin with increased biological activities US6900292. August 2001. 91. Delorme E, Lorenzini T, Giffin J, et al. Role of glycosylation on the secretion and biological activity of erythropoietin. Biochemistry. 1992;31(41):9871-9876. Departamento de Farmacología, Faculta de Ciencias Biológicas, Universidad de Concepción, Chile.